Hi everyone! The blog group I belong to has a challenge every month and this month we are doing a really neat challenge. For the month of December the Craft Gal's Blog Group is doing a 'Guess Who I'm CASEing' challenge. We were to go back and pick another blog group member's card to case from the month of March. Well, I goofed and the card I decided to case was from the month of October (sorry about that), but once the person I cased this from sees this card she will know it's hers. I had to case this card because after I saw it the first time I had to go and order the En Francais stamp. We aren't supposed to reveal whose card we cased until we've all had a chance to guess them so I'll come back on Friday and update this post with a link to the original card I cased. ETA- here is a link to Jackie's card that I cased. I stamped the lower portion of my background using the En Francasis stamp and the upper portion of my background was stamped using the Hello Doily stamp. The two images meet in the middle and it was pretty close, but it didn't really matter since my ribbon covered up that part. My flower was stamped using the Daydream Medallions stamps and it was cut out using my floral frame framelits. I have dimensionals under each layer of my flower. I finished off my card by stamping a sentiment and punching it out using the jewelry tag punch and I also added a small button with some twine tied through the center. I hope you like my card today! Thanks so much for stopping by! Have a great rest of the day! Pretty card, Patty! I really like the colors. I think I know!!!. It looks so much like her style!!!. I'll check right away!!!. Awesome job Patty!!! 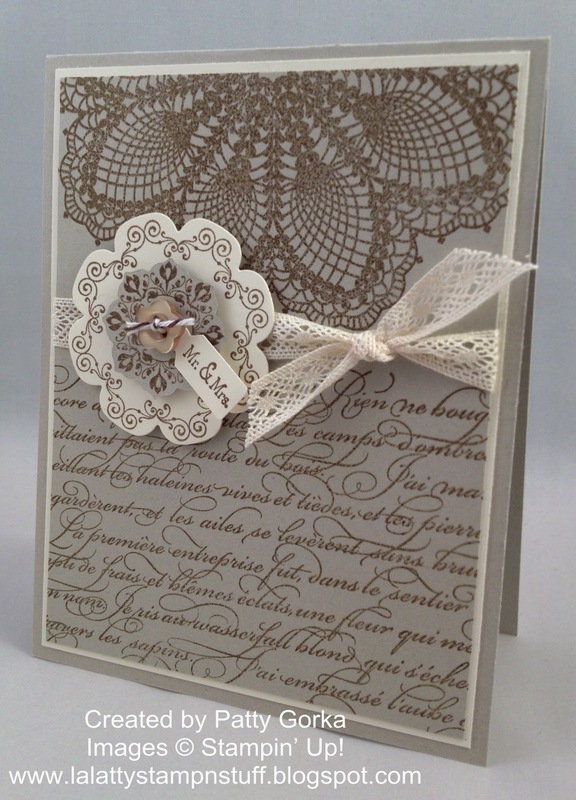 Gorgeous card with every little detail that goes with it!!! Your card is stunning Patty--I love the design. Oh Patty, this is so pretty! I love the monochromatic browns. Perfect card! Gorgeous! This is absolutely stunning. Patty, I can't figure out who you cased, but whoever it was, you sure created a BEAUTIFUL card from her inspiration. Love the colors. Love the layout. Love the card! Oooh, ooh!! I remember this card, but for the life of me can't remember who...Jackie? That's my guess! I think this card is gorgeous! Love how you've combined stamps to make the pattern, instead of using a DP. The flower is so decorative together with the beautiful lace. A beautifully designed card! Love your card. En Francais and French Script are my two favorite background stamps from SU! It goes great with the medallion stamps that you used.